Because of the abundance of misinformation that is prevalent in many writings about Father Divine these dates that we present here should correct a portion of these errors. 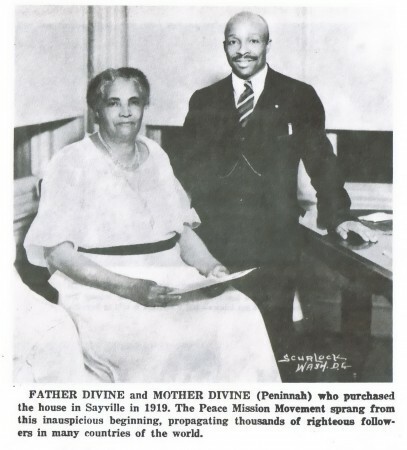 “There is much to be said and a great deal to be learned about The International Peace Mission Movement and it’s founder and Pastor Father Divine, since it began to take form in 1932.” Father Divine and Mother Divine, whom he married in 1882, moved to Sayville, a quiet fishing village on the south shore of Long Island, New York from Brooklyn in 1919. 3. That out of one blood GOD created all the nations to dwell upon the earth. He came to bring them all together in One. 1882: June 6th: Father Divine Married Peninnah. Peninnah gave us this date and declared it was because of his Deity that she desired to be Father’s helpmate. Father Divine verified this date. 1893: Father Divine left Brooklyn, according to HIS own statement, and went south just after the Jim Crow Law was passed in Grover Cleveland’s administration to Prove That a Man Is a Man and Not a Color, Creed or Race. He also wanted to prove that the Gospel Can Be Preached Without Purse or Script and That the Consciousness of the Presence of God Is The Source of All Supply. Because of the stand He took, FATHER Was in the Hands of Lynch Mobs 32 Times. 1906: Joseph Isaac King, Great Uncle to Martin Luther King stated that he was with Father Divine when they visited San Francisco after the earthquake. This is the only record of this that we have but Mother Divine stated that is was possible or even probable because it was at that time that the Holy Ghost descended on California and FATHER might very well have been there to stir things up. 1914-1919: During these years, to the best of our knowledge, Father Divine had a residence on Lefferts Place in Brooklyn, New York. There was a Peace Mission Extension in the same block at #70 Lefferts Place with a public dining room that served 10 and 15 cent meals to the public during the depression years in the 1930s through to the 1950s. 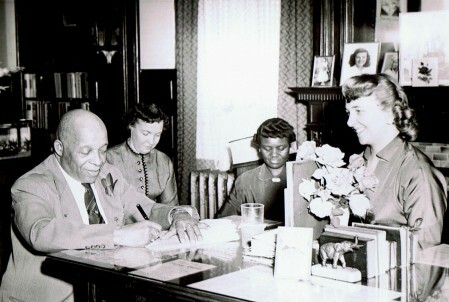 Father Divine visited and lectured there 9 times that we have records of from 1939 to 1953. 1919: Father Divine Left Brooklyn, New York City and Established His Residence in Sayville, Long Island, New York, where, during the depression, HE fed up to 300 people a day. The home is also now Designated as a Suffolk County Historic Landmark. 1931 through 1932: The “Word of GOD Revealed,” Is Recorded in the notebooks of John Lamb. The Word of GOD Revealed Was Published as 70 installments in 1974 with an introduction and conclusion. 1932, May 31st: Father Divine sentenced to 1 year in jail for creating a public nuisance. Three days later Judge Smith died. Retribution Followed the Wake of Persecution in Sayville. The previous article attests the law of retributive justice that is psychologically meted out according to the scientific functioning of the exorable laws of GOD. 1932: Father Divine Began the Establishment of the Many International Churches as Mr. Walter C. Lanyon and the Young Family from Australia, Among Others, Carry the Message Abroad to England, Europe and Australia. 1933: Father Divine Established His headquarters in Harlem, New York City where He fed and housed the people. A complete meal was 10 or 15 cents and housing was $1.50 or $2.00 per week. 1936: Six Radio Broadcasts by Father Divine and The Peace Mission were presented over Station WBHI, Newark, N. J. 1936: The International Righteous Government Convention Presented Father Divine’S Righteous Government Platform in New York City and also a Righteous Government Convention was convened in Los Angeles, California. 1936: The Father Divine Peace Mission Freedom Riders Were on the Move.. Integrated Bus Loads of Followers Traveled from California, Through the South to New York City and Returned Several Times under the Protection of GOD, Father Divine. 1936: Audio Records were made on 12 inch Platters and on Wax Cylinders called Dictographs. 1937: The New Day Publication Began. 1937:A Cabinet for a Secretary of Peace first proposed December 23,1937. President Eisenhower created this Cabinet in his administration. 1938: The first Peace Stamp was published. These stamps were placed on the envelopes of all correspondence from Father Divine’S office and of many of the followers. In this letter FATHER explains in detail the purpose of these many proposals made to Governments and then sent as Peace Stamps around the world. The following are some of these Peace Stamps. This was the first of many Proposals made by Father Divine for world peace and brotherhood as are the next 9 on the list. 1939, December 9th: Why not unite the three Americas as a national and international defense for Peace? 1945, May 9th: I wrote Hirohito, urging him to surrender for humanity’s sake and the redemption of millions of bodies. 1945. August 5th: Japan surrendered unconditionally. 1945, October 23rd: Buy Bonds Unlimitedly the Victory of Peace to win. 1947, June 11th: Bring an end to the rights of states that are unconstitutional, to have their sovereign rights. 1939: On September 3rd, 4th and 5th at the Invitation of City Officials Father Divine held huge mass meetings at “The Baker Bowl,” then the Phillies Ball Park, on Lehigh Avenue and at The Music Fund Hall, 830 Locust Street, demonstrating integration and brotherly love to Philadelphia. 1940: The Peace Mission Movement Began the Legal Organization of the Five Established Churches with its’ many branches. 1941, September 28th: The Tarrytown Estate, Tarrytown, New York, was purchased and dedicated to brotherhood and the service of humanity..
1942: Father Divine Moved His Headquarters to The Circle Mission Church in Philadelphia, Pennsylvania With Most of the New York City Establishments and Followers following. 1942, July 7th; The Dedication of the Brigantine Hotel, as the first in the United States, of five totally integrated first class hotels under The Peace Mission Movement, took place. 1944.; The Pine Brook Hotel, formerly, The Belmont Hotel and Country Club, in Pine Brook, New Jersey was dedicated to Democracy. 1948: The first Electronic Audio Recordings were made on Wire Spools, then transferred to tape in the 1950s and now are being recorded onto CDs. 1949, February 7th: The 10 story, first class, Divine Lorraine Hotel was Dedicated in Philadelphia breaking down the segregation of the hotels of Philadelphia and finally throughout the United States. It is Now Designated as an Historic Landmark. 1950, July 17th:The Divine Tracy Hotel, an eight story building in the University City area Philadelphia, was dedicated. 1950, July 18th:The Divine Riviera Hotel in Newark New Jersey was dedicated. 1953: The Mount of the House of the Lord at Woodmont was dedicated. It is Now Designated a National Historic Landmark. 1963: The Divine Fairmont Hotel in Jersey City, New Jersey was dedicated. 1965: The Year of the Holy Advent, Father Divine’S Personal Sacrifice on September 10th. 1965: Mother Divine was legally recognized as Spiritual Head of the Peace Mission Churches along with Father Divine. 1968: The Shrine to Life was dedicated September 10th, 11th and 12th. 1970: “The Portal of Life Eternal”, the door of the Shrine to Life was dedicated. 1970: Mother Divine became an American Citizen at the Ceremony at Valley Forge Park and HER Name Sweet Angel Divine was legalized. 1982: The Philadelphia City Council on February 4th, 1982 lauding and commending the Peace Mission Movement for over half a century of dedication and service to God and the community. 1998: The Mount of the House of the Lord was designated in 1998 and in 1999 dedicated, as a National Historic Landmark. by The National Park Service. 2000: Recorded Radio Broadcasts of FATHER and Mother Divine speaking and reading started over Station WTMR, 800 AM, From Camden N. J. 2002: Radio Station KAAY, 1090 AM, From Little Rock, Arkansas was also broadcasting the same as WTMR of Camden. 2006: The creation and erection of a library began to hold and display material pertaining to the Work and Mission of Father and Mother Divine and The Peace Mission Movement.